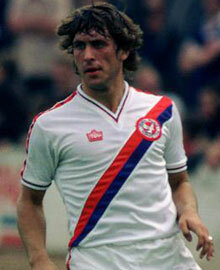 I suppose I must have become aware of Kenny Sansom as he broke into the first team in the mid-70s. I was never a great connoisseur of defenders... generally speaking they stayed in their correct positions like dummies in a game of table football in those days. Generally their job was to stifle the opposing forwards and, that accomplished, to stay back until the next offensive. But after the Second World War, football was changing fast under the influence of the Continental and South American games. The concept of the overlapping full-back had become commonly accepted by Kenny's emergence but the problem was always finding anyone talented enough to be able to do it. In Kenny Sansom's case the talent was there in abundance - a strong and muscular frame with a low centre of gravity, a brilliant positional sense and the scorching speed to be able to get into an attacking position and back into defence again. He was certainly a precocious player, making his first team debut at the age of 16, and coming through in the late 70s with that phenomenal flowering of talent from the youth team including Vince Hilaire, Billy Gilbert and Paul Hinshelwood. By 1977, teenaged Kenny looked the complete article and he was later a big influence in getting us up for our second term in the old First Division. But, needless to say, it would all end in tears and in 1980 Kenny went to Arsenal in exchange for Clive Allen (both valued at £1m, a colossal amount in those days). There were strong rumours at the time that the transfer was to enable Kenny to pay off gambling debts with his cut from the transaction. Born in Camberwell in 1958, he went on to gain 86 caps for England, nine of them while he still played for Palace but it still sticks in my craw - as with the later move of Ian Wright from Selhurst to Highbury - that he is still remembered as though he had exclusively played for the Gunners. Both Kenny and Ian owe their later successful careers to the chances and careful nurturing they got at CPFC. My final thought on Kenny is recalling a game in around 78-79 when he went off on one of his scorching runs down the left flank. His centre was intercepted by an opposing player and he made one of his characteristic backward scuttles to defend. "Blimey," said a neighbouring fan, "our Ken can run faster backwards than most players can forwards!"